Parents of a baby born via surrogacy don’t have the opportunity to carry their baby in utero, which is how many parents emotionally and physically bond with their baby before he or she is born. But this certainly doesn’t mean that you’ll have a weaker bond with your child if they are born via surrogacy. It simply means that you might need to play catch-up and bond a little differently. Like in any new relationship, you and your baby might need to spend some time working on your physical and emotional bond. Remember that families who come together through surrogacy love each other no more or less than any other family, and they’ll tell you that. It might be disappointing if you don’t feel that magical instant bond with your child right now, but don’t worry — it’ll happen! This is where these surrogacy-specific bonding tactics come in. Healthy infants were shown to have reduced responses to painful stimuli like vaccinations, blood sampling, or cord cutting during skin-to-skin contact. Babies cried less, were calmer and went to sleep more quickly when on their parents’ chests. Newborns that had immediate skin-to-skin contact experienced physiological benefits that included improved thermoregulation, cardiopulmonary stabilization, blood glucose levels, enhanced oxygen saturation levels, breathing and sleep patterns. For preterm infants who spend time in the NICU, skin-to-skin contact is even more important for brain development. Skin-to-skin contact has been linked to decreased separation anxiety. Reduced risks of hospital-acquired infection were shown in babies who received skin-to-skin contact, as they acclimated to the surrogate’s and intended parents’ bacteria and received the protective benefits of that bacteria. The salivary cortisol levels (a biochemical marker for stress) were significantly decreased in all babies when the length of skin-to-skin increased beyond an hour. The levels continued to decrease with longer contact periods. Skin-to-skin contact is simple. When the baby is born, parents often like to place the naked baby on their bare chests as quickly as possible, for as long as possible, sometimes even while the baby is being cleaned and the cord is being cut. This is recommended for a minimum of an hour, if possible. You may have also heard this method called “Kangaroo Care.” Some parents will delay routine medical steps until after this bonding time if their baby is healthy and stable. If you’re unable to have skin-to-skin contact with your child moments after he or she is born, don’t worry. Bonding through physical touch with your child is something that will continue to be beneficial to both of you as they grow up. Physical contact between a parent and their child is a good way to strengthen bonds, no matter when it starts. When packing to meet your baby at the hospital for the first time, include shirts that can be unbuttoned to allow quick access for skin-to-skin contact with your baby on your bare skin while preserving your modesty and comfort. 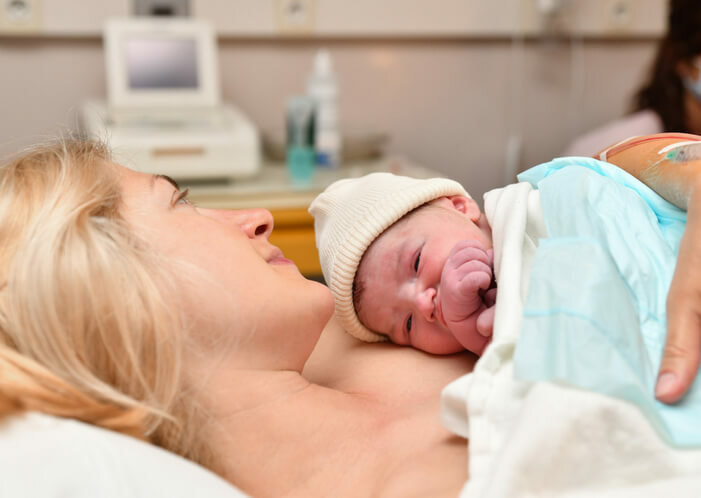 You and your surrogate will need to talk to your hospital nursing staff in advance about your wishes for skin-to-skin contact, and explain that you’re the intended parents in this birth plan. You’ll likely need to remind the hospital staff of these details in the busy aftermath of birth, but this way they’ll know not to swaddle the baby immediately, to avoid placing the baby into an incubator right away, or to hold off on some of the routine medical procedures like weighing your baby until after you’ve had time to hold him or her. There are some studies that show that having skin-to-skin contact with the surrogate first may be beneficial for the baby, as a newborn is able to colonize her bacteria (maternal flora vs hospital flora) faster. This may reduce the chances of your child forming allergies and getting an infection. If everyone is comfortable with this, your baby’s health can benefit from this step, and then you would be able to have skin-to-skin contact with him or her next. This is another transitional step for your baby; remember that they’ve become attached to your surrogate in the previous nine months of development. Remember to follow the advice of the hospital staff at your baby’s birth! Sometimes even carefully planned births don’t go exactly as we envisioned, so you may not be able to have that early skin-to-skin contact with your baby for whatever reason. Again, don’t worry. You’ll have plenty of opportunities to bond with your child soon. Talk to your baby in your surrogate’s womb. Try giving your surrogate a recording of your voice reading books to play to your baby through headphones on her belly so your child can hear your voice. Stay active in the pregnancy process as much as your surrogate feels comfortable with. This is more for your sake than for your baby’s, but participating in your surrogate’s pregnancy and staying in touch with her can help you feel more like your baby is “yours” and facilitate your own emotional attachment. If you want and are able to, you can try to breastfeed your baby. This is not a necessity for bonding with your child, but it can be a wonderful experience for both of you. Breastfeeding is possible for many intended parents with preparation. Give lots of gentle touch and physical affection. Hugs, baths, play time, holding hands, brushing hair, carrying your baby in a sling or just holding and cuddling your child is important for newborns as well as for young children. Talk to your child. Studies have shown that talking to your children at any age vastly improves their language skills in addition to promoting bonding. Tell them the story of how they were born, sing to them, read them lots of books, give them verbal praise and affection or even just tell them again how much you love them. Prioritize routines. Getting into a regular feeding and sleeping schedule can sometimes be tricky, particularly with newborns. However, the ritual of those routines will not only make your life a little easier, but your child may also benefit from the bonding time during those daily rituals. Bath times, getting dressed, feeding times, reading a book together in your arms before their nap, singing the bedtime song — whatever you do for your daily routines, try to use it as an opportunity to spend some quality time together and focus solely on your child. With time, you’ll likely find ways of bonding that work best for you and your baby, because every family is different. In the meantime, don’t stress too much. The parent-child bond may or may not be immediate for you, but it’ll happen, and when it does, it’ll be just as strong as it is with any parent and child. You can always contact an American Surrogacy specialist at 1-800-875-BABY (2229) if you need additional post-surrogacy resources. Previous Previous post: Thank You to Our Staff During National Social Work Month!